PLT’s Tim Caufield, Joe Townsend and John v.H. Halsey at the trailhead at the Edwards Farm. Former Greenport Mayor and Southold Councilman Joseph Townsend has been a longtime champion of the preservation of Edwards Farm at Orient Point, and this winter, the Peconic Land Trust honored Mr. Townsend for his work with a plaque at the entrance to hiking trails at the property, which was preserved by the Trust with help from Mr. Townsend and the community in 2015. 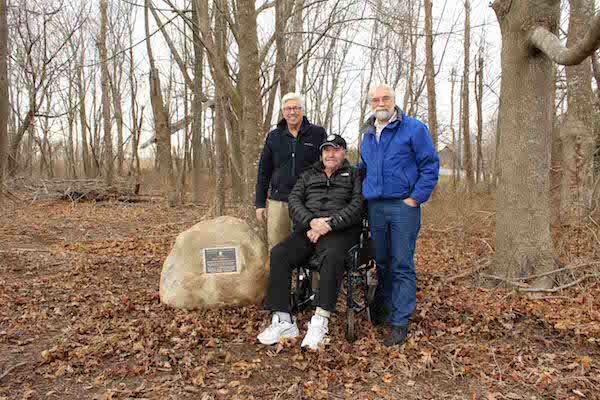 The Trust is also honoring Mr. Townsend, who recently was diagnosed with ALS, with a new nature observation platform at the Edwards Farm that will overlook Hallocks Bay and Orient Beach State Park. Tax-deductible donations for the Townsend Observation Platform may be addressed to The Peconic Land Trust, attention: Townsend Observation Platform, P.O. Box 1776, Southampton, NY 11969. The trailhead is at 36960 Main Road, Orient, just to the east of Terry Lane. The proposed observation platform, which will be accessible to the public but will not obstruct the natural setting, will overlook waters where Mr. Townsend logged thousands of training miles as a nationally ranked oarsman. Mr. Townsend, who was also a longtime board member of the Peconic Land Trust, has served as the President of the Long Island Indian Museum in Southold, the home to many Native American artifacts found by North Fork farmers while tilling their fields. He was also instrumental in the preservation of Dam Pond/Ruth Oliva Preserve in East Marion and the former Exxon/Mobil property, now the Widow’s Hole Preserve, in Greenport. He was also an advocate in a successful effort to make Orient Beach State Park’s Long Beach accessible to boaters and hikers. In the summer of 2015, the Peconic Land Trust joined with members of the Orient community, Southold Town and the Edwards family to purchase and protect 21 acres of farmland, woodlands and wetlands that had belonged to the Edward, Latham, and Terry families since the early 19th Century. Superstorm Sandy caused major damage to the south portion of the farmland, when a tide gate was destroyed. The Trust is working to reinstall a traditional tide gate to reintroduce tidal flow to the wetlands, in an attempt to control mosquitos, diversify and increase the farm’s habitat areas, and aid in protecting the farm and surrounding properties from the effects of sea level rise and large storms. In 2015, Southold Town purchased the development rights on the property using $700,000 from its Community Preservation Fund and the Peconic Land Trust purchased the title to the land using its Revolving Fund. The total cost of the farm was $1.09 million. This farmland, woodland and wetlands join a 600-plus acre assemblage of protected land between Narrow River Road and the Cross Sound Ferry terminal. Faced with a $390,000 deficit, plus costs to complete the deal and begin restoring the farm, the Trust embarked on a three-year, $450,000 fundraising campaign in 2015. To date, they have raised over $100,000, with gifts ranging from several hundred dollars to as much as $30,000. Once the money is replenished, the Trust hopes to preserve other farmland in the area, including the 17.6 acre farm to the east of the Edwards Farm. Currently, Danny and Patty Latham of Latham Farms lease and farm the Edwards farmland.